1PG and Research Department of Physics, N M S S V N College, Madurai-625 019, India. 2Departamento de Química-Física I, Facultad de Ciencias Químicas, Universidad Complutense,Ciudad Universitaria, Madrid-28040, Spain. University of Pretoria and National Health Laboratory Service Tshwane Academic Division, Pretoria, South Africa. 4School of Health Sciences, University of Kwazulu-Natal, Westville Campus, Durban, South Africa. 5Indian Spectroscopy Society, KC-68/1, Old Kavinagar, Ghaziabad-201 002, India. 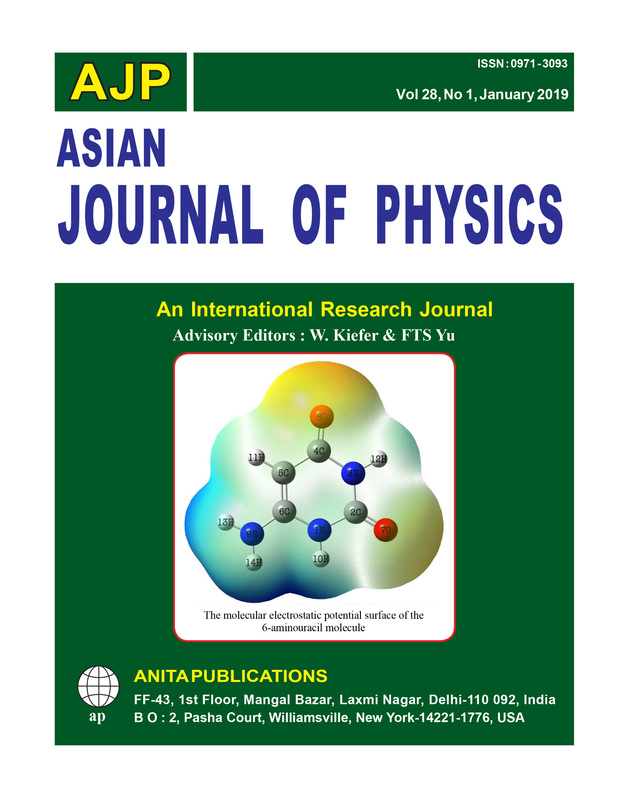 The quantum chemical investigations of the 6-aminouracil (6-AU) molecule were studied using density functional theory calculations. The molecular docking and molecular dynamics simulations were performed to evaluate the inhibitory activity of the title molecule. The molecular structure of the molecule was optimized by DFT/B3LYP method with 6-311++G (d,p) basis set using Gaussian 09 program. The frontier molecular orbitals and related molecular properties were computed, which reveal higher molecular reactivity and stability of the molecule. The density of states spectrum of the molecule was also simulated. The solvent effects on UV-Visible spectra of the molecule were simulated and an impressive bathochromic shift (red shift) was observed going from the gas phase to solvent. The first order hyperpolarizability of molecule was calculated as 1.407 ×10–30 esu, which was 3.77 times greater than the value of urea (0.3728 × 10–30 esu). The molecular electrostatic potential surface was simulated and local reactivity descriptors analysis was performed to investigate the reactive nature of the molecule. The natural bond orbital analysis was performed to confirm the bioactivity of the molecule. The molecular docking and molecular dynamics analyses were performed which confirm the anti-diabetic activity of the molecule. Hence, the current investigation will be useful for developing the effective therapies in the treatment of type 2 diabetes mellitus (T2DM). © Anita Publications. All rights reserved. Keywords: 6-aminouracil, DFT, FMOs, UV-Visible, MEP, Molecular Docking, Molecular Dynamics and Anti-diabetic activity. A semiconductor memory device comprises active areas between and isolated by isolation regions. An active area may include a diffusion region caused by ion implantation at the top proximate the substrate surface. The diffusion region has a diffusion region width that is larger than the active area width forming a mushroom shape. This will require an increased distance between two isolation regions and decrease the density of the formed memory device. A process is proposed to reduce the diffusion region width thus to substantially eliminate the mushroom effect. © Anita Publications. All rights reserved. 1. Lin W C, CRC Handbook of Digital System Design, Second Edition, (CRC Press), p. 225, 1990. 2. Bez R, Camerlenghi E, Modelli A, Visconti A, Introduction to flash memory, Procd IEEE, 91(2003)489-501. We characterized the phase noise and linewidth of asymmetrical Distributed Feed Back Fiber Lasers (DFB FLs) using unbalanced Michelson interferometer and delayed self-homodyne method, respectively. Experimental results verified the close relation between the phase noise and linewidth of the DFB FLs tested, the phase noise increased from –109dB to –94dB as the linewidth increased from 1.6 kHz to 4.8 kHz. This relationship can be utilized for the assessment of the DFB FL phase noise based on the linewidth characteristics. © Anita Publications. All rights reserved. Keywords: Distributed feedback fiber laser, Phase noise, Linewidth, Unbalanced interferometry. Fibre Sensors, (23 May 2005). doi.org/10.1117/12.624303. 2. Azmi A I, Leung I, Chen X, Zhou S, Zhu Q, Gao K, Childs P, Peng G, Fiber laser-based hydrophone systems, Photonic Sensors, 1(2011)210-221. Conference Proceedings, 760, 1630 (2005); doi.org/10.1063/1.1916865. a mode-locked fiber laser system, Opt Commun, 285(2012)153-157. 9. Ludvigsen H, Tossavainen M, Kaivola M, Laser linewidth measurements using self-homodyne detection with short delay, Opt Commun, 155(1998)180-186. To boost the safety of any cryptosystem and to safeguard it from any attackers, this paper offers a innovative asymmetric cryptosystem based on amalgamation of two different transforms namely Fourier (FT) and Fractional Hartley transform (FrHT). In this cryptosystem a new Hybrid Structured Phase Mask (HSPM) is used along with Random Phase Mask (RPM). HSPM is generated by merging Structured Phase Mask (SPM) and the Hybrid Mask (HM). The HSPM and RPM are used as the encoding keys in the asymmetric system and the decryption keys generated during encryption are reserved as the decoding keys. The usage of this new mask HSPM helps in enhancing key space as a result helps in overcoming problems related to axis alignment. Decoding is exactly the reverse of the encoding mode. The competence of the suggested mode includes analysis using Single Value Decomposition (SVD), histogram, entropy and correlation coefficient. To analyze the performance of our proposed system our recommended cryptosystem is open to occlusion attack and noise attack. The robustness of the recommended system is analyzed and verified using MATLAB R2014 (8.3.0.532). The experimental consequences are delivered to focus the aptness and power of the proposed cryptosystem. © Anita Publications. All rights reserved. Keywords: Fourier Transform, Fractional Hartley Transform, Asymmetric key algorithm, Hybrid Structured Phase Mask, Single Value Decomposition. In this article, we will show that the paradox of the Schrödinger half-live cat’s is primarily due to the underneath subspace; in which the hypothetical subatomic model is submerged within a timeless (i.e., t = 0) empty subspace. And this is the atomic model that all the particle physicists, quantum scientists and engineers had been using for over a century, since Niles Bohr’s proposed in 1913. However the universe (our home) is a temporal space (t > 0) and it does allow any timeless subspace in it. We will show that by immersing the subatomic model into a temporal subspace (i.e., t > 0), instead a timeless subspace (i.e., t = 0), the situation is rather different. In which, we will show that Schrödinger’s cat can only either alive or dead, but not at the same time, regardless we look into or not look into the Schrödinger’s box. We have also found that, by imposing the constraint of causality condition t > 0, superposition principle fails to hold. In which, we have also shown the whole quantum space is a timeless subspace and it is not existed within our temporal universe. And this is by no means that quantum space is a useless subspace. On the contrary, it has produced uncountable numbers of useful solutions for practical applications, as long the causality condition (t > 0) is not violated. In which we see that “instant spontaneous” (i.e., t = 0) particle entanglement and “instant simultaneous” (i.e., t = 0) computing are not existed within our temporal subspace (i.e., t > 0). In short, we have shown that Schrödinger mechanics is a timeless virtual quantum calculator which only existed at = 0, unless temporal component (i.e., t > 0) is introduced. © Anita Publications. All rights reserved. Keywords: Schrödinger’s Cat, Quantum mechanics, Superposition Principle,Timeless subspace,Temporal space, Atomic models. 1. Yu FTS, Time: The Enigma of Space, Asian J Phy, 26(2017)149-158. 2. Yu FTS, Entropy and Information Optics: Connecting Information and Time, 2nd Edition, (Boca Raton, Fl, CRC Press), 2017, p 171-176. 3. Bohr N, On the Constitution of Atoms and Molecules, Philos Mag, 26(1913)1-23. 4. E. Schrödinger, Probability relations between separated systems. Mathematical Proceedings of the Cambridge Philosophical Society, 32(1936)446-452. 5. Susskind L, Friedman A, Quantum Mechanics, (Basic Books, New York), 2014, p 119. 7. Bennett C H, Quantum information and computation, Phys Today, 48(1995)24-30. A 3 days International conference on "Aerosol, Air Quality and Climate change" was held in Srinagar (Garhwal), Uttarakhand, India from 21st to 23rd October, 2018 hosted by the Department of Physics, Hemvati Nandan Bahuguna Garhwal University (A Central University), Uttarakhand in Collaboration with the newly formed Society,” Indian Society of Aerosol, Air Quality and Climate Change Research (ISAACCR)”, Srinagar (Garhwal) and Uttarakhand Science Education and Research Centre (USERC), Dehradun, India. The conference started by playing traditional Uttarakhandi instruments to celebrate the arrival of distinguished guest and participants.